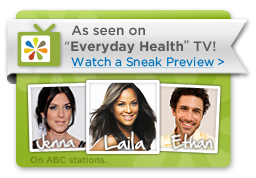 Several months ago, we were lucky enough to meet Ethan Zohn and Jenna Morasca from Everyday Health TV. They came out to Calabasas and helped us organize another flash mob for Claire’s Place Foundation and raising awareness for cystic fibrosis. We had such a great time working with them and fell in love with Ethan and Jenna. We hear Ethan is battling yet another phase of cancer. Our hearts and prayers are with him! They came back again in February to film our Day at the Beach Fundraiser. We will get that episode up as soon as possible for those of you interested. As always, thank you for your love and support! We are working so hard to keep our foundation up and running,…we are committed and excited to help other families living with cystic fibrosis. Our foundation and the services we hope to provide are only made possible by your generous donations. Please keep us in mind and spread the word!